I am finishing a basement room and have a concrete ledge which is part of the foundation. It protrudes into the room about 2.5 inches and is about 6 inches high. This ledge is the result of a particular way of pouring the foundation which results (as I am told) in higher ceilings in the basement, but leaves this rather annoying ledge. (See photos). Apparently there are multiple ways of working with this type of thing, which I learned from looking at similar homes in my neighborhood: Some people frame the walls inside the ledge completely, effectively shrinking the finished room by that amount; others have framed up to the window sill height and created a shelf in the room at that height. I've chosen to maximize space in the room and finished the walls above the ledge intending to create an exaggerated baseboard around the concrete ledge. However, exactly how to do that is proving difficult. 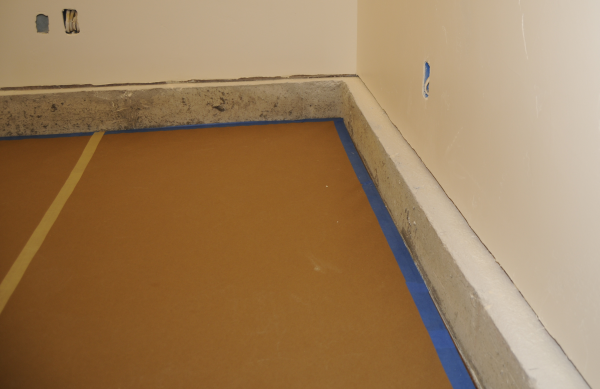 First, the concrete thickness (protrusion into the room) is not consistent. 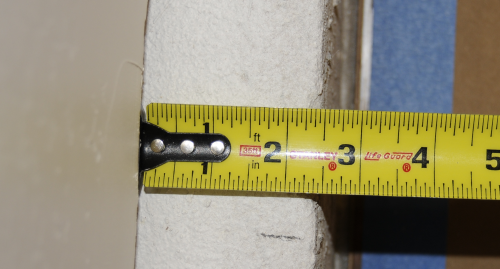 It's 2.5 inches in the middle, but is nearly 2.75 at one end and 2.25 at the other. Whatever I cover it with will have to compensate. The height of 6 inches is fairly consistent. Next the concrete is not smooth, there are many small protrusions which will have to be worked around or removed with a chisel or hammer. Finally, I'd like to have a small measure of insulation so that the room is isolated from the cold concrete. A. 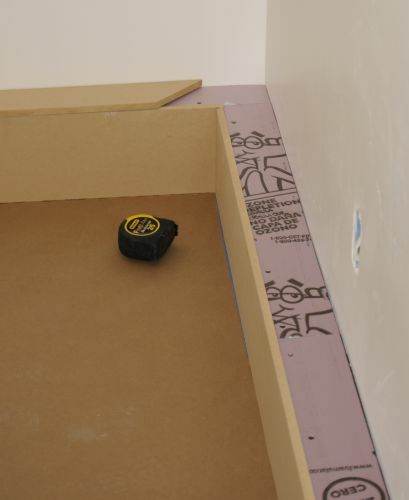 Use an adhesive to attach dense insulating foam, about 1/2 thick, to top and side of ledge. Attach MDF to these surfaces using adhesive, and router the corner to a rounded edge. Prime and paint. B. Rip some 2x4's to a 1/2 to 3/4 inch thickness and attach to ledge face every 16 inches, using concrete anchors. The thickness of the 2x4 would vary so that the end result is square with the room and makes up for the irregular shape of the concrete. Attach MDF to these. Fill air gaps with expanding foam insulation. Finish MDF with with a routered corner, prime and paint. I'm not sure if there is a better or common way of building around such concrete ledges. The heart of the question: Is there a recommended way to build around a concrete ledge like this? The basement is at ground level. The room is 11 ft. by 9.5 ft. (105 sq. ft.) The ledge is only on two exterior sides. The flooring will be laminate. The existing walls are insulated, framed, and already have finished drywall with texture and primer. I decided to go with plan "A" and thought I would post an in-progress picture. Thanks for the suggestions and tips. We had an almost identical situation in a former garage that we refinished to be an office. 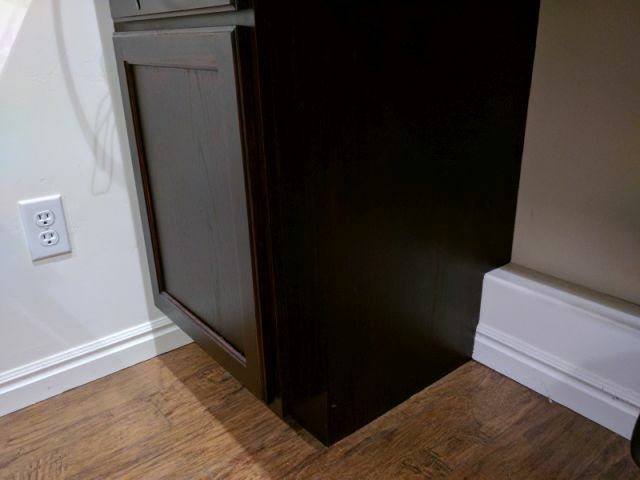 Our contractor suggested this and we liked the result: he installed a piece of wood about an inch out from the concrete, putting insulation between them and keeping the wood a consistent and level height - a little higher than the concrete. I can't remember if it was pink fluffy insulation or spray stuff. 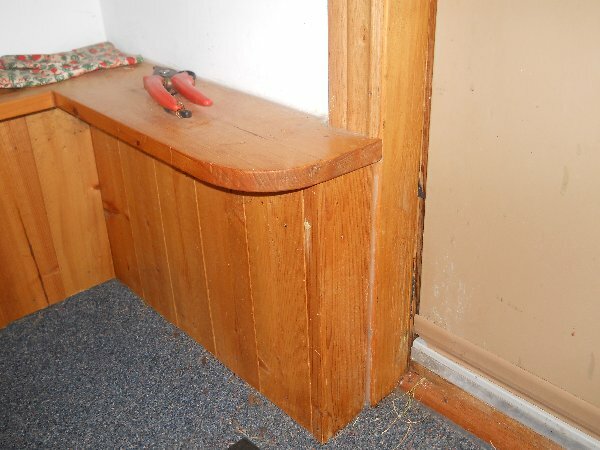 Then a shelf about 6 inches out from the wall - nice and level by being a bit up from the concrete and supported by the vertical wood, and there's insulation under the shelf too. The whole thing is a good looking clear pine and is well varnished. The shelf runs around the entire room and is remarkably useful for something so low. It hides all the lumpy bumpy aspects of the concrete and while it's not something you see everywhere, no-one has ever mentioned it so it can't be that unusual. 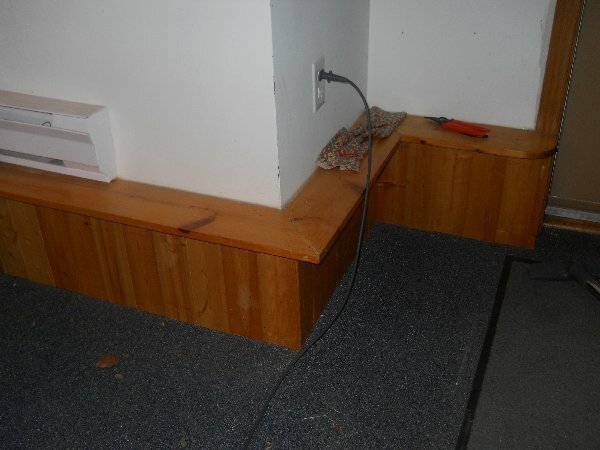 Have you thought about maybe just building a bench around the room to encase the concrete ledge? I'm not sure what the intended use of the room is, but a bench might be neat for a play room or entertainment room. Looks like you will want to be creative. 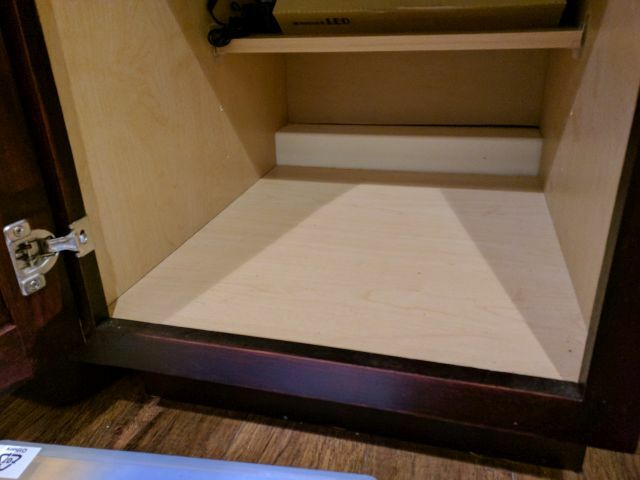 I'd start with either a bench seat on part of the perimeter, essentially built-in storage, or a higher cabinet. In either case, use it as storage space. Since this will be a home office, an option is to make the wall a cabinet all the way up, partly display case & shelves. Our last house had one wall that was entirely build-in shelves above a bank of cabinets. Lots of useful storage, and gives it a library feel. Around the rest of the room, maybe you could do a wall in knotty pine tongue and groove as a paneling? Again, it gives a warm feeling on the walls. Our ceiling and one wall of the great room is that way in this house. Since the pine will be 3/4 inch thick on the wall, then you have just an extra bump out around the base, with a piece of molding on top of the cement "step" to hide it. But this way, it will look not that out of place to have the base built out with a pine bump. Wherever you will build it out with a baseboard, I'd start with a 3/4 inch square nailing strip, nailed to the floor on the base. Have another nailing strip on top of the cement, this time nailed to the wall. Pine baseboard straight up from the floor, and a pine cap above that goes to the wall itself. I'd go with knotty pine for this because it is cheap and will take some knocks without looking too bad. Cedar is a bit soft for down there. Fill behind the baseboard with fiberglass insulation stuffed in. Run a decorative molding above the top edge to east the transition into the wall. The nice thing about use of a nailer strip is you can vary the thickness easily enough with a bit of quick custom hand planing (power plane for the lazy) to make it fit, leaving a straight edge. And a nailer then makes it easy to attach the baseboard. Not the answer you're looking for? 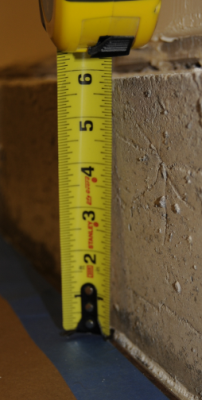 Browse other questions tagged concrete basement finishing baseboard or ask your own question. How can I attach normal framed walls in between concrete columns? How should I finish a basement with a pitched floor? What can I do to transition between concrete and drywall? How to renovate a basement floor? How can I level a concrete floor in a basement room?